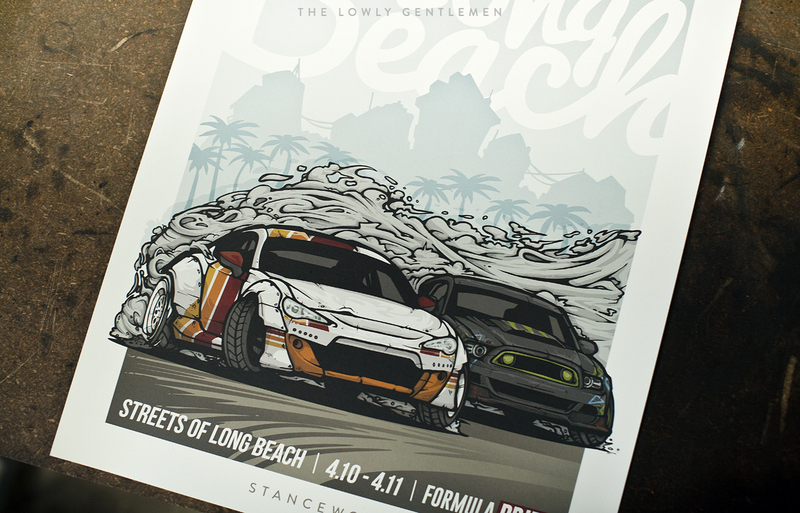 Event posters are where art and automobiles have come together for decades, so when I began discussing potential collaboration projects with Formula Drift, my mind instantly jumped to the prints that so often proceeded races. Despite the style that runs rampant through the drifting culture, it's rare to find art that echoes the dynamic atmosphere of the events. 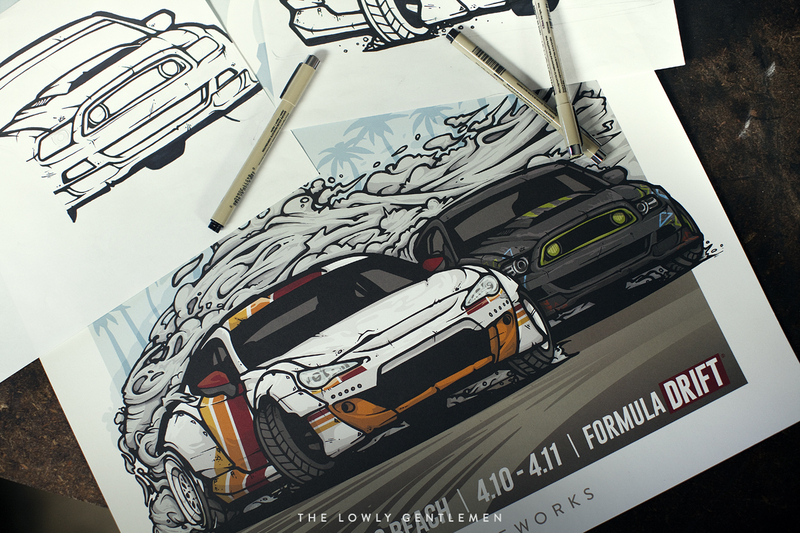 With the premier Formula Drift event landing in our own backyard, I knew it posed the perfect chance to break out my markers once again and apply the StanceWorks artistry to a fun new project. I have been attending the Formula Drift Streets of Long Beach event for years and its atmosphere makes quite an impression. The course winds through streets otherwise relegated to daily commutes, with the city's skyline acting as a backdrop to the tire-squealing battles. The cars dance through the turns with their exhausts echoing and roaring off the barriers and buildings. I wanted to capture the same raw feeling of action in my drawings. In our latest Art Print, Ryan Tuerck's FRS and Vaughn Gittin Jr's Mustang tear up the tarmac and paint a swathe of smoke across Long Beach's city streets. The 24"x18" limited edition prints have each been stamped, numbered, and signed to mark their authenticity, and the colorful scene has been full-color offset printed using vegetable inks on high quality, thick 12pt paper stock. While supplies last, we will be selling the prints for $35 plus shipping.